I spent much of my studio time in the early months of 2017 working on a new art quilt that I have titled Ground Zero Reborn. The idea for the piece came directly from a visit that I made to the Ground Zero site in Manhattan in early November 2016. 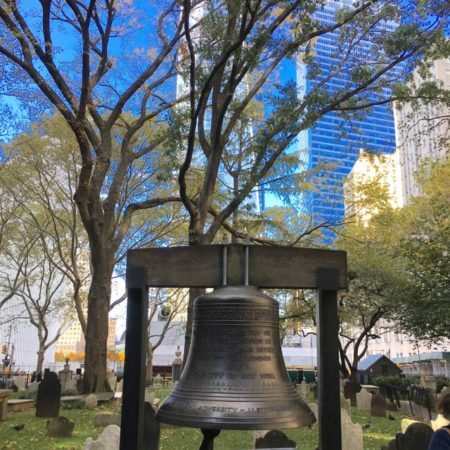 The financial district of Manhattan has always been important in my life as my parents met while working on Wall St. and my father worked for an investment firm for his entire career. 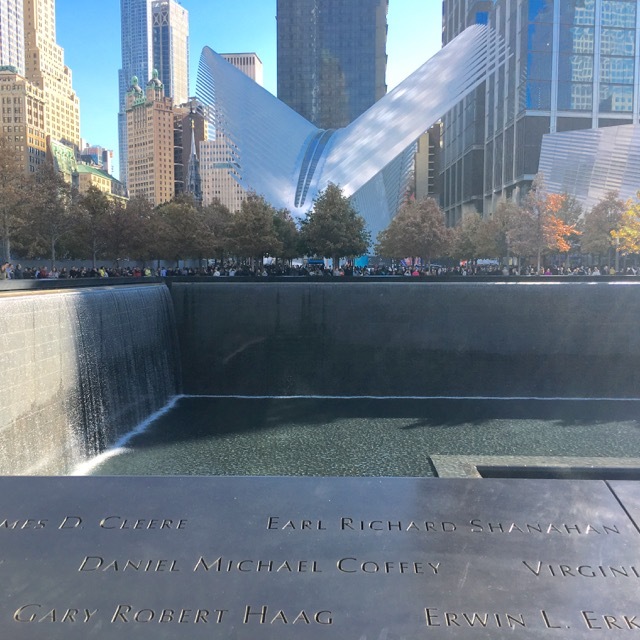 After 9/11, I visited the Ground Zero site whenever I was near New York City. I remember peering through plywood walls in the early weeks, years later standing in line for hours to gain admittance to the reflecting ponds and finally on this last visit walking down into the Memorial museum. 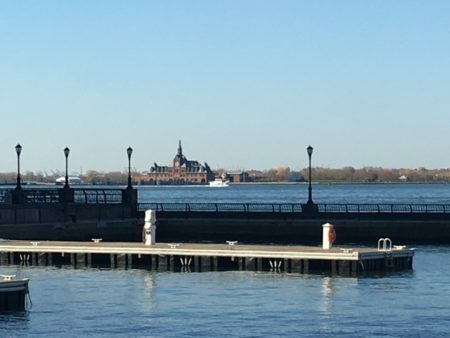 In the weeks after my November visit, I realized that something had definitely shifted for me. I had gained some perspective and perhaps some reassurance that whatever was thrown at us as a country, healing was possible with time. 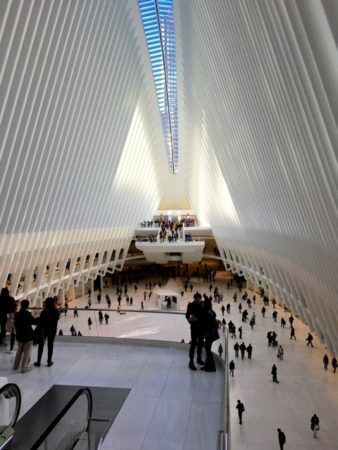 I have no doubt that my feelings of hopefulness were due in part to the choice of white marble for the interior of the massive Occulus transportation hub which lies on part of the Ground Zero site as well as it’s amazing roof design that reminded me of a bird taking flight into the future. Photo of the Occulus building taken in November 2016 from the memorial ponds. My new art quilt, Ground Zero Reborn, reflects my perspective now, in 2017, on the Ground Zero site and the journey of the site since that fateful day. It does this through three separate but joined art quilts. The lowest quilt in the grouping, Remember, speaks to the horrible carnage and destruction of that fateful day when the towers came down. It is essential in my world view that we never forget horrific world events caused by mankind and that we learn from them so hopefully they will never be repeated. 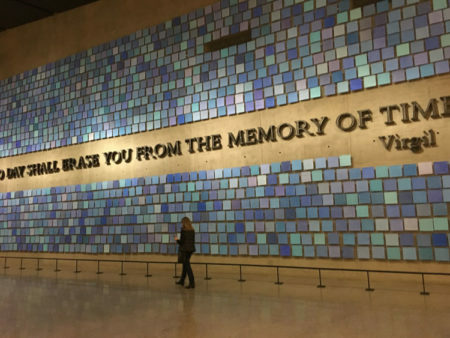 The middle quilt in the sequence, Respect, honors the nearly 3000 victims of the terrorist attacks on 9/11/2001 and 2/26/1993 as well as all those who risked their lives to help save others. It underscores the important place of respectfulness in modern society. It is my fervent hope that in paying homage to those who lost their lives, we will be inspired to commit to living our own lives at a higher level as we have the privilege of life. 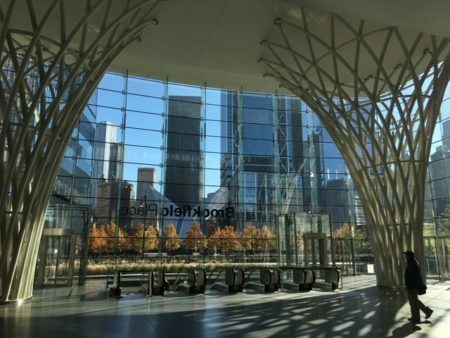 The top quilt in the group, Rebirth, acknowledges the steps forward that Manhattan has taken to rebuild and revitalize its damaged community and population. I see in the image the spirits of those lost on the site soaring to the heavens. The piece truly embodies my hope that we will learn from the past and work towards a future without violence. 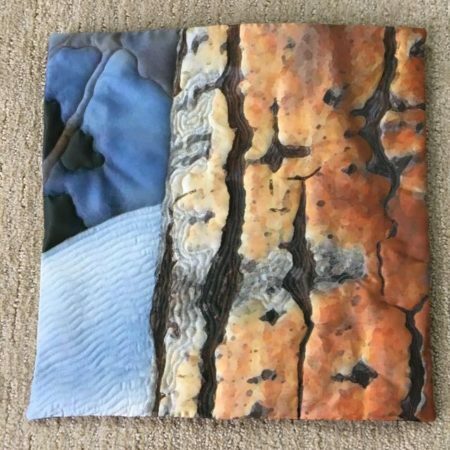 The three art quilts that are Ground Zero Reborn were created using multiple fiber techniques as appropriate to each quilt. Much of the stitching was done by hand with care and loving thoughts for those that lost their lives on the site. A sense of resolution or closure at the end of an artisitic work. I have been working fairly intensely on a project for the past two months that revolves around the Ground Zero site in Manhattan. I revisited the site last November and wrote about it in a post on this blog. As I wrote in that post, it was not my first visit to the area but this last visit was meaningful in that I began to see past the horrors and the sadness and to recognize new life or rebirth in the area. It was that experience that prompted me to create an art quilt that captured my perception of this transformation. 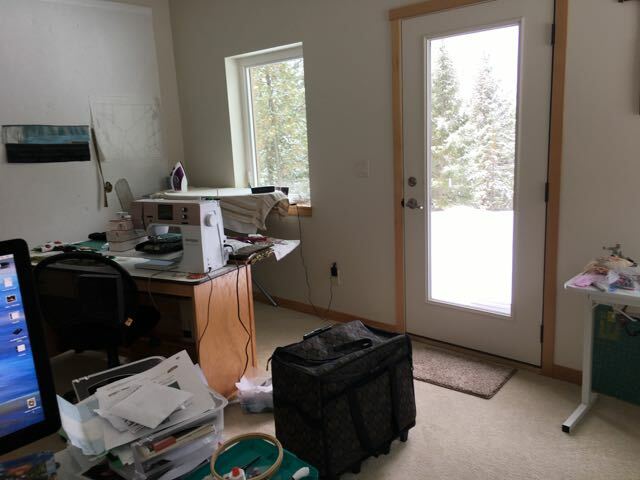 That large case that you see is for my new Bernina 765 machine that I purchased a month ago to celebrate my birthday. I had decided that 2017 would have a mantra of ‘simplify, simplify’. I have owned an 830 for many years, along with the embroidery attachment that I simply could never get excited over. My 830 was finicky…….it did a beautiful job of free motion quilting once I had the tension just right. But, I had come to realize that my needs were simpler than an 830. My 765 sews for me instantly, whenever I need a straight seam. And, when I want to quilt with it, it does so without any objection. I am in love with it and wondering why it took me so long to change. Getting closure on projects has proved quite simple with my 765. And so, I retrieved my UFO Aspen III that I wrote about last year and finally faced and labeled it. As a result, I am pleased to be an early bird for the 2017 SAQA Auction. I am looking forward to finishing my Ground Zero quilt and moving on to other projects. Hope that you are all moving forward too!